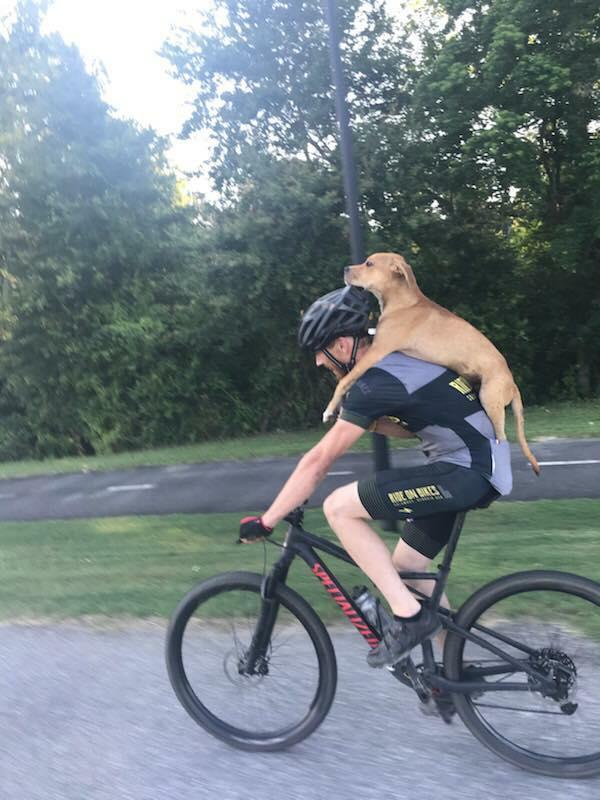 Mountain biker Jarrett Little was with a group of fellow cyclists riding in the woods near Columbus, Georgia, when he spotted a creature who needed his help. It was a stray dog that appeared to have been hit by a car. "We stopped to regroup and he came out of the woods to greet us. He was really thin, ribs showing and had a lot of road rash and a broken leg," Little told CBS News. He says he and the other cyclists fed the dog and gave him water, but knew they couldn't leave the dog in the woods. Little didn't have a car to transport him, just a bike. So he hoisted the pup onto his back, and rode into town looking for help. Little said once they arrived in Columbus to search for help, he and the pup met a woman who took an interest in him. Andrea Shaw, who was there on a business trip, started talking to Little about the stray he had biked in from the woods. "Right when we returned to my local bike shop to get him some more water and food, we instantly ran into Mrs. Andrea who was in town from Maine," Little said. "She decided to keep him and get him checked out medically." Little says Shaw took the dog off his hands, and not only got him medical help, but a new home. "She paid for him to have his leg repaired with surgery and found an organization that could help get him back to Maine to live on her horse farm," Little said. Shaw also picked an appropriate name for the dog: Columbo, in honor of the town where she met him. Little says he's lucky fate brought him, Shaw and Columbo together in the small Georgia city. "Had I been five mins earlier or five mins later, we wouldn't have crossed paths with her," Little said in a message to CBS News. "It's pretty cool how far he's come." Once Shaw got Columbo — nicknamed "Bo" for short — back to Maine, she posted an update on his health. "Bo traveled with 25 staples in his hind leg after having four pins to put in to stabilize the fractures and a full cast on a front leg to stabilize a broken toe," Shaw wrote. "They gave him all his meds and kept him comfy until he was back in my arms," she said of the company that transported the pup, Canine Freedom Transportation. A photo of Little carrying Columbo on his back spread like wildfire online. He says after the photo went viral and people heard Columbo's story, "Andrea go so many fans" that she decided to start a Facebook page for her new dog. The Adventures of Columbo not only provides updates on the lucky pup on his new horse farm, but also spreads awareness for other dogs in need. I love my BIG brother Luquillo. He’s a 13 year old German Warmblood. Mom says he’s a fancy dressage horse.